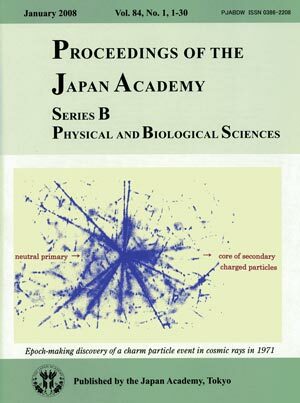 Discovery of a charm particle in cosmic rays in 1971 by Niu et al. This illustration shows a photograph of nuclear emulsion in which the first evidence for a new particle was observed. This new particle turned out to be a totally new kind of elementary particle. It is believed to be composed of the 4th quark, named “charm”, whereas three “up”, “down” and “strange” quarks are well known. This epoch-making event had occurred 3 years prior to the discovery of the J/Ψ particle in large accelerator experiments by two Nobel prize winning groups in the United States, but its priority has not been properly recognized for a long time. 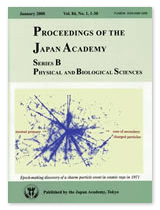 See the review article in this volume by Kiyoshi Niu. The discovery took place while the Japanese group carried out cosmic-ray exposures and subsequent track identification using a newly developed emulsion chamber, which was a stack of multi-layered material sheets and emulsion films. The figure shows a historical micro-photograph of a cosmic-ray interaction, in which a pair of naked charm particles was revealed. A super-energetic neutral primary particle (not seen) flied in from the left-hand side with a large incident angle to the plane. It collided with a nucleus located in the center of the plane, and produced a big event of type of (19+70)n. Black tracks scattering out from the center are those of some of the 19 evaporated particles from the target nucleus. A short fan-shaped dense core toward the right-hand side down off the plane is a bundle of 70 high-energy charged secondary particles. In the down-stream of this bundle, a pair-decay of naked charm particles was observed.